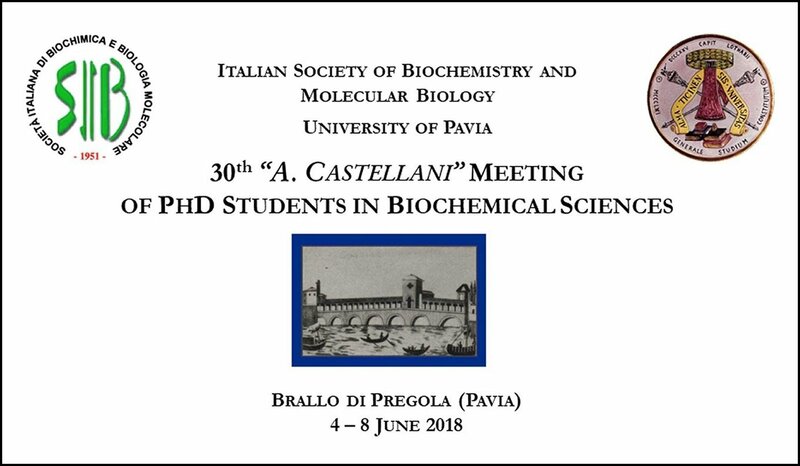 The Italian Society of Biochemistry in collaboration with the Biochemists of the University of Pavia organizes every year, in June, a meeting of the PhD students in Biochemical Sciences “ A. Castellani”. This year, the meeting has celebrated its 30th edition and was confirmed again as a unique, excellent and highly appreciated opportunity for the Italian PhD students to join together, get to know each other, discuss science and establish lasting personal and scientific collaborations. The series of the Italian annual meeting of PhD Students in Biochemical Sciences (http://www-3.unipv.it/bralweb/) was started in 1988 as an initiative of Professor Alessandro Castellani, an eminent Biochemist and Rector of the University of Pavia. In 1989 the meeting was named after its founder, who passed away prematurely. Since then, the meeting has been held regularly every year, thanks to the organizing efforts of the Biochemists of the University of Pavia, and the fundamental support from the Italian Society of Biochemistry. The series was interrupted only once, in 2011, when the Italian Society of Biochemistry was honored to host the 36th FEBS meeting in Turin. The venue of the meeting has rigorously remained unchanged over the years: a pleasant and isolated resort located in a very small town called Brallo di Pregola, immersed in the Italian green Apennine mountains, just 50 km South of the city of Pavia. For this reason the meeting is generally referred to as the “The Brallo meeting”. In this quiet and peaceful environment, PhD Students from all over Italy join together for five days and become the true protagonists of the meeting. The unique characteristic of the Brallo meeting is that it is conceived to really belong to the students. A few invited speakers giving main lectures leave most of the time to students for the presentations and discussion of their results. PhD students are also invited to chair the sections and to animate the discussion. The number of participants is typically limited to no more than 60 PhD students because of space limitation. Students enrolled in any National PhD programs involving research in the biochemical field, particularly those in the second or third year of the program, are entitled to participate. The Italian PhD programs underwent a profound reorganization in the recent decades and many of the former PhD programs in Biochemistry have been merged into larger, multidisciplinary schools. The Brallo meeting has thus become a unique opportunity for PhD students from different schools to identify with their common interest and commitment for Biochemistry. Over the 30 editions, more than 2,000 PhD students have attended the Brallo meeting, which has involved 37 different Italian Universities, also located in the South of Italy, Sicily and Sardegna islands. Every year, the meeting is much appreciated by the attendees. Feedback is generally very positive and typically many PhD students who have attended the meeting return the following year. The official language of the meeting is English and thus foreign guests are also welcome. For the 30th edition, representatives of the European project RELEVANCE (Regulation of red cell life-span, erythropoiesis, survival, senescence and clearance) of the Marie Sklodowska-Curie Actions Innovative Training Networks (ITN) joined the meeting. The Brallo meeting is an established scientific initiative of the Italian Society of Biochemistry and is probably unique of its kind in Italy. For this reason, the Italian Society of Biochemistry intends to continue supporting its organization and will be glad to know about similar initiatives undertaken by other European Biochemical Societies.